I am a firm believer in a balanced diet. In fact, this is one of the main reasons why I run – so that I can eat and drink whatever I like (whilst balancing the calorie-counter books by running a marathon every weekend). However, I do recognise the need to periodically consume the odd vegetable and the Mielie* Marathon seemed like a healthy way to start 2019. * That’s ‘corn on the cob’ for international readers. Welkom is an easy 3-hour drive from Johannesburg – most of which is double-lane highway down the N1. 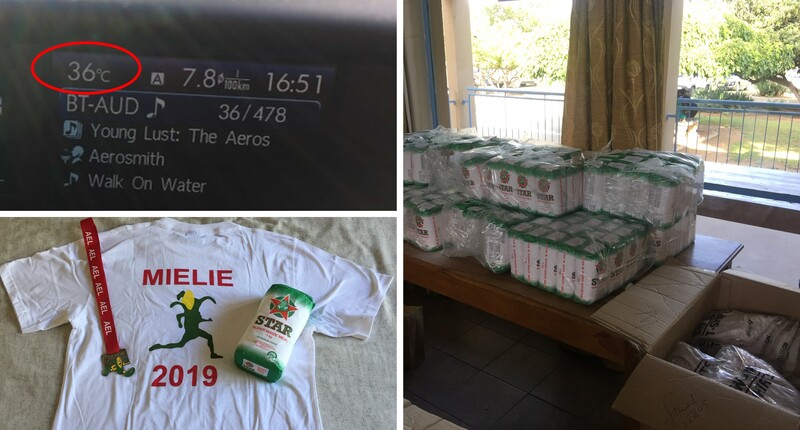 Although the drive is easy, getting out of your airconditioned car on arrival isn’t – it was still a scorching 36°C (97°F) at 5pm when I collected my race number, ‘running mielie’ shirt and a 1kg pack of mielie meal at registration. A hot arrival but a good haul at the Mielie Marathon. 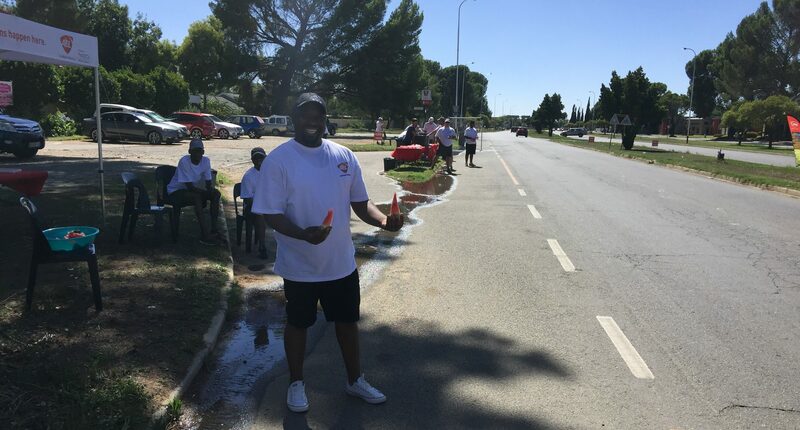 This year’s event had just over 800 participants equally spread over the four distances on offer – a full marathon, half marathon, 10km and 5km ‘Colour Run’ for the kids (which I would suggest renaming to the “Children of the Corn” Fun Run). With heat a big factor in this part of the world (the average January temperature is 32°C/90°F*), we got going at 5:30am but not before the local dominee, Ds. Phillip McClaren, gave us a detailed route description followed by a short prayer. * Although it never snows in Welkom, on a windy day your car will get covered in a fine white powder, these are known as ‘corn flakes’. Local dominee Phillip McLaren got us going (and made sure there were no runaway brides in the field). 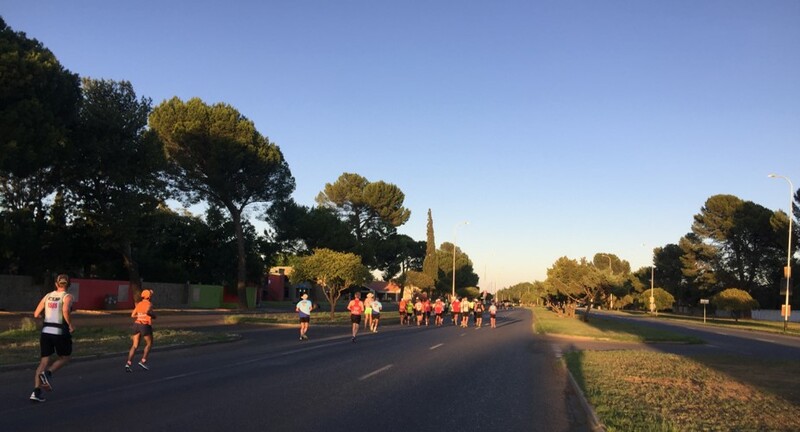 The first 7km are through the suburbs and it wasn’t long before we hit the Welkom city limits and started feeling the heat from the rising sun. Enjoying the shade in the suburbs. Having said ‘Totsiens’ to Welkom, you head due north on the R30 on stereotypical Free State landscape – flat, dusty and hot. The gold price might fluctuate but the altitude remains a steady 1,350m in this part of the world. A route profile that steadier than the gold price. The one thing you don’t have to worry about in Welkom is hills. 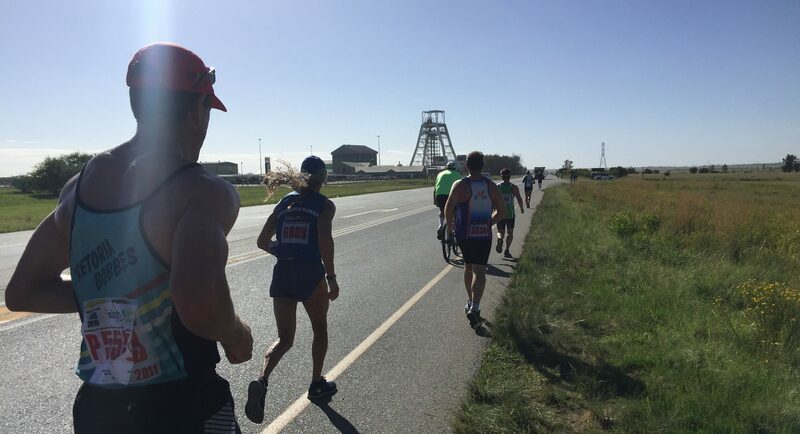 There is only one hill in the entire region – aptly (but very uncreatively) named Koppie Alleen (‘Only Hill’) – and the organisers make sure that you go nowhere near it during the marathon. A course for racing flats. Welkom has yellow mielies above ground and yellow gold below. Until recently 25% of all gold globally was mined here. The goldmines provide the only contrast to the monotonous, flat landscape. Whilst passing one of the mines, a conversation started within our running group where we all agreed that these days only politicians can afford to wear gold, the rest of us get to eat mielies. Goldmines provide the only contrast on the flat landscape. 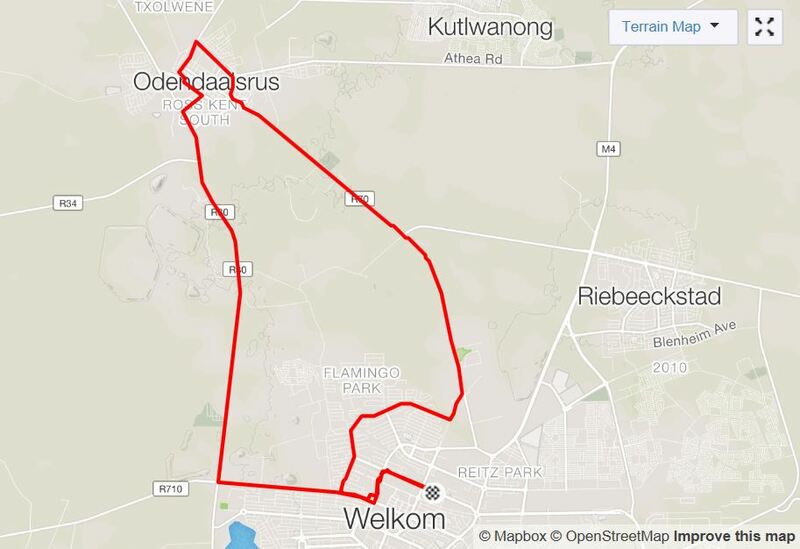 You hit the neighbouring town of Odendaalsrus at the 17km mark. As luck would have it, I bumped into local legend (and Odendaalsrus resident), Louis Massyn. 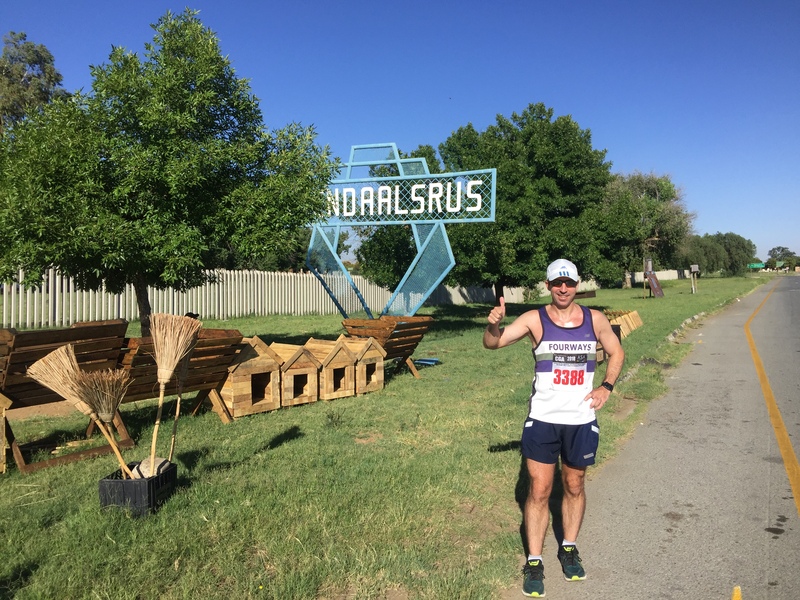 Four decades ago (all the way back in 1979), Louis and a few friends decided that Welkom needed a marathon – so they grabbed the husk by the ears and planted the seed that is now the oldest marathon in the Free State. Heading into the neighbouring town of Odendaalsrus. 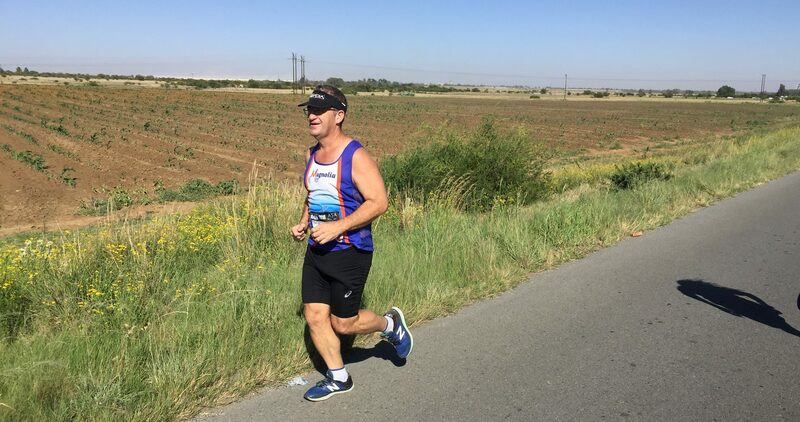 Louis, who holds the joint record of 46 Comrades finishes, completed his 38th Mielie this year and I enjoyed a few kilometres in his company. He relayed a lovely story about how he used hometown advantage to its fullest to win the race in 1984: It was just another long run for Louis who was cruising around the familiar streets until he realised that the first 40 runners had been sent the wrong way by a marshal. Being one of the race organisers, Louis set the marshal straight and all the runners behind Louis ran the correct route. No one wants to run any extra kilometres in a marathon so, too scared to overtake Louis and get lost, everyone else followed his lead back to finish. Although Louis was reluctantly declared the official winner he declined any prize money – and would like to make it clear that the marshal concerned was not a family member. One of the race’s founders, Louis Massyn, well on his way to a 38th finish (and still making the most of hometown advantage). This part of the world seems to have the right ingredients for producing talented long-distance athletes. 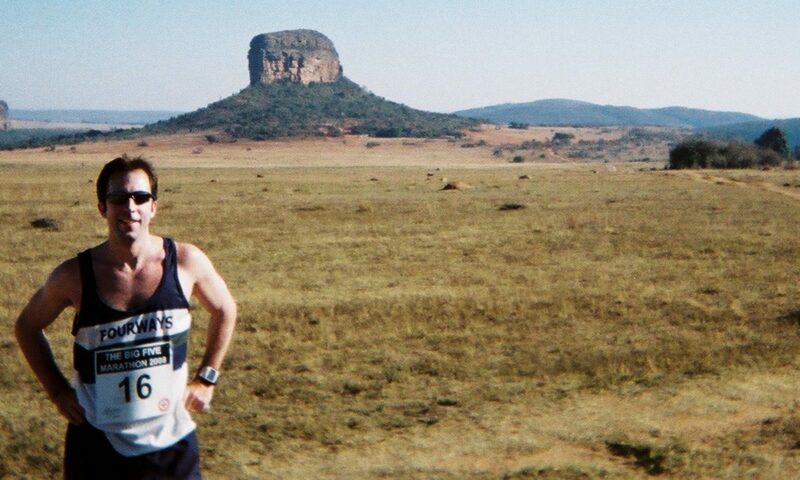 1991 Comrades winner (and 9-time gold medallist), Nick Bester, was born and bred in Odendaalsrus and many great runners have based themselves in Welkom during their running careers. These include Xolile Yawa (1993 Berlin Marathon winner and 9-time South African national 10,000m champion), Vincent Rakabele (the first black man to win a Comrades gold medal) and Jan Olyn (the Kalahari Express). Another runner who was schooled in Welkom was Isavel Roche-Kelly: she was the first lady to dip under the 7h30 silver cut-off at Comrades 1980 and then followed this up with a 6h44 win the following year (in 2019 the Isavel Roche-Kelly medal will replace the silver for women at Comrades). Departing Odendaalsrus (if you want some shade you have to get into the dog box). Once your short tour of Odendaalsrus is over, the shaded streets disappear and you head back out into the goldfields – this time along the R70. More gold mines on the way back to Welkom. 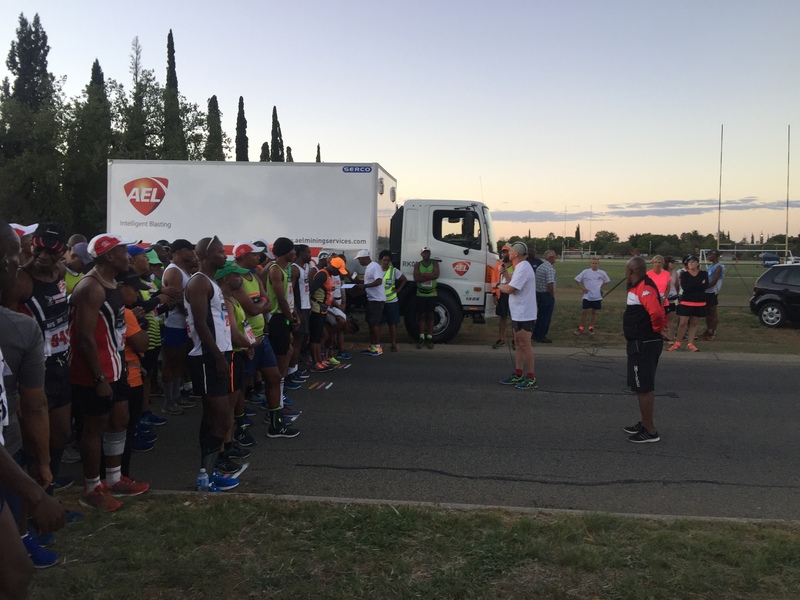 This is the perhaps the toughest part of an easy course, a very gradual 50m pull over 8km – certainly not a hill or anything to make a mielie meal* about. * In a race report about mielies, a few corny jokes are a pre-requisite! A few years ago, Modern Athlete Magazine launched a #RunClean campaign to encourage runners to tidy up after themselves and refrain from littering. This has grown momentum and an increasing number of races are disqualifying runners who don’t throw their water sachets into the bins provided. 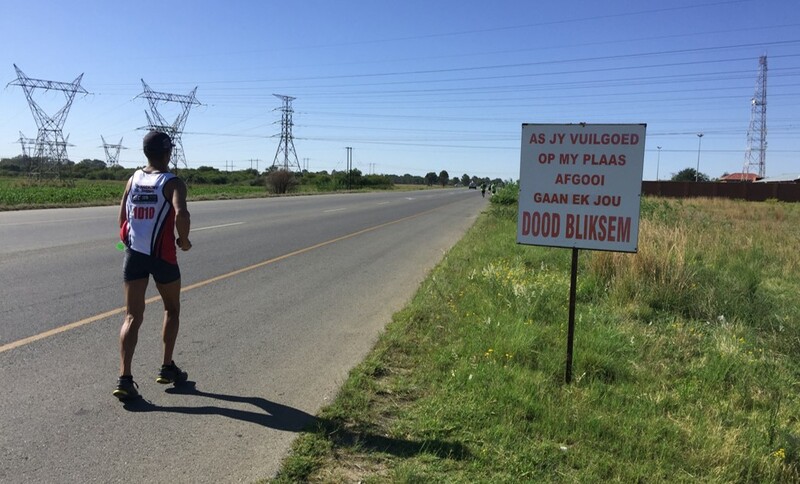 In the Free State they have taken the #RunClean campaign to the next level as you can see from the sign below. The mielie harvest is much later* in the year so you don’t actually get to see any real life mielies during your run (but the odd cornfield does provide a change in scenery from the goldmines). * I understand that it is even later in Welkom where they time the planting to harvest in the middle of winter – this avoids the problem of having their prized crop popping off the kernel**. 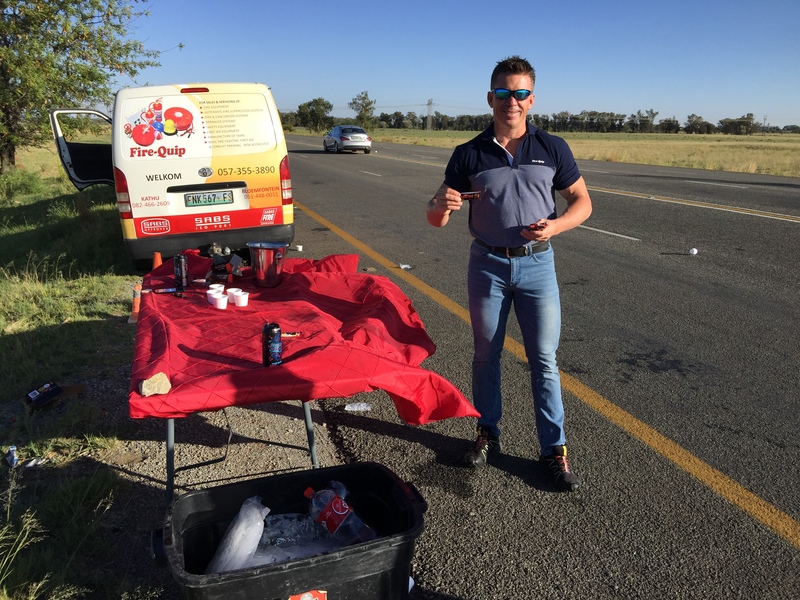 ** I’m glad none of the tables were handing out popcorn – that stuff has serious roughage and would have given new meaning to the phrase ‘to gooi mielies’. Tobie Reyneke trots passed the cornfields. Tobie has run 54 one hundred milers (and by the time these husks are ready to shuck he will probably have run half-a-dozen more). However, if you were a little peckish, most of the support tables had their braais going and the Star – Super Maize Meal table would happily share some of their pap and wors with you. 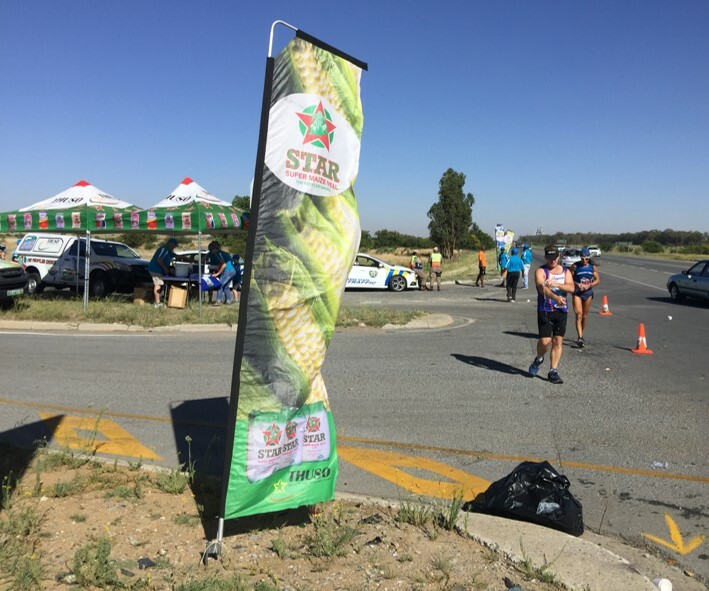 Star – Super Maize Meal gives every entrant a 1kg bag of mielie meal and had one of the excellent support tables along the route. The tables on the route were well stocked and I had a chuckle at the firefighting equipment table: I have no idea whether it was intentional but, for those who remember their 80s adverts, the ‘firemen’ were handing out Bar One chocolates (I guess they work for a 25-hour day and a 26-mile run!). Firemen agree that Bar Ones work for a 25-hour day and a 26-mile run. 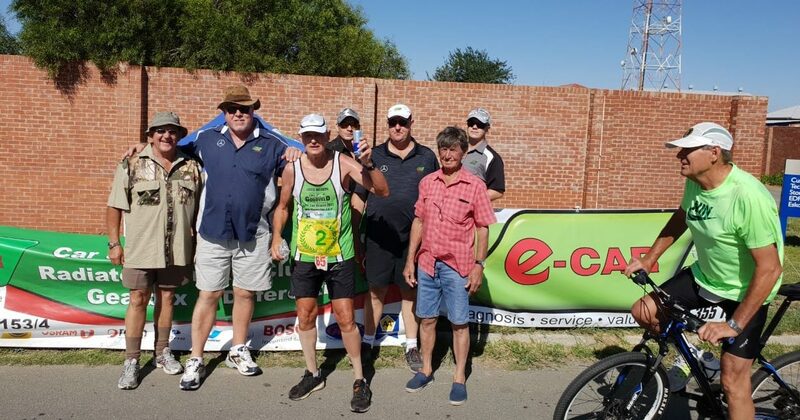 At the 34km mark you are welcomed back into Welkom – and runners with their wits about them hug the pavement to grab the few bits of shade on offer. Here your push to the finish line is aided by the friendly faces – and the delicious, juicy, chilled watermelon on offer – at the AEL table. This is exactly what you want to see at the end of a marathon – a friendly face & some juicy, chilled watermelon🍉. About the sponsor: AEL Mining Services has sponsored the Mielie Marathon for the last 12 years. The company was founded in 1896, as African Explosives Limited, when gold was discovered on the Witwatersrand. They are the leading provider of blasting products and services for the mining industry. The company has a global footprint and is part of the AECI Group. For my money (and my legs), the Mielie Marathon is the gold standard of January qualifiers. There are prettier races out there* but this fast, uncongested, single-lap route on wide open roads should let you the reap the rewards from your end of year training. 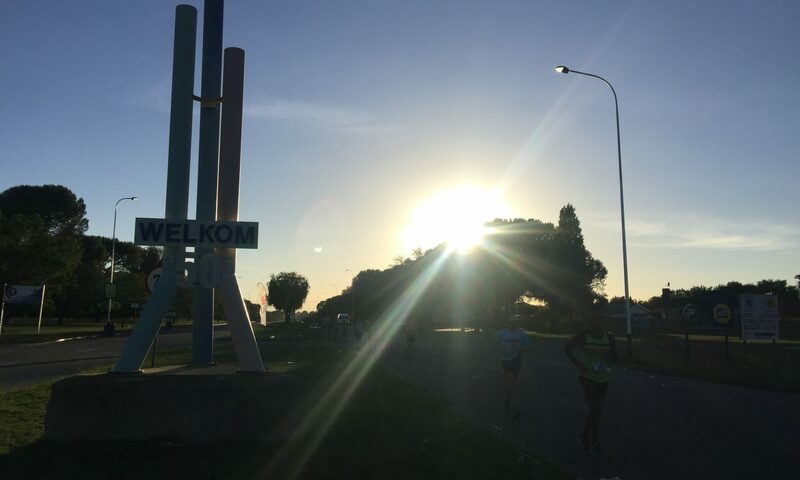 * Welkom is no beauty but is still a more attractive proposition than two laps around Benoni. 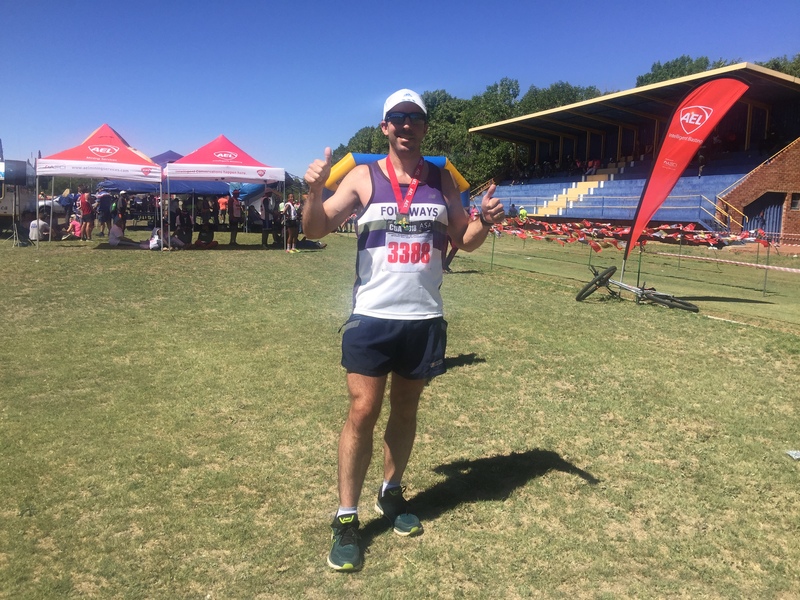 Signing out from Welkom – look out for the next report from the Ottosdal Night Marathon. Another good read Stuart, and just loved your corny jokes. Great report as usual Stuart. I know that race well having lived in Welkom. I used to run with Louis many years ago at Welkom Harriers when Isavel was around. Does the route still have a section of dirt Road near half way? Note: Just check the year the AEL was founded. I think it might be a typo. Thanks Peter – it’s all on tar these days but not sure whether this is a route change or not. PS Fixed the typo – it should have been 1896!